I wish my great-great-great-grandmother could answer my questions. I’ll bet I’m not the only one who wishes she had asked her parents and grandparents more questions about family history before it was too late. Although I asked some, and did tape (remember tape recorders?) my grandmother’s reminiscences when she was close to 100, there are other questions that occurred to me only when I began writing my memoir. 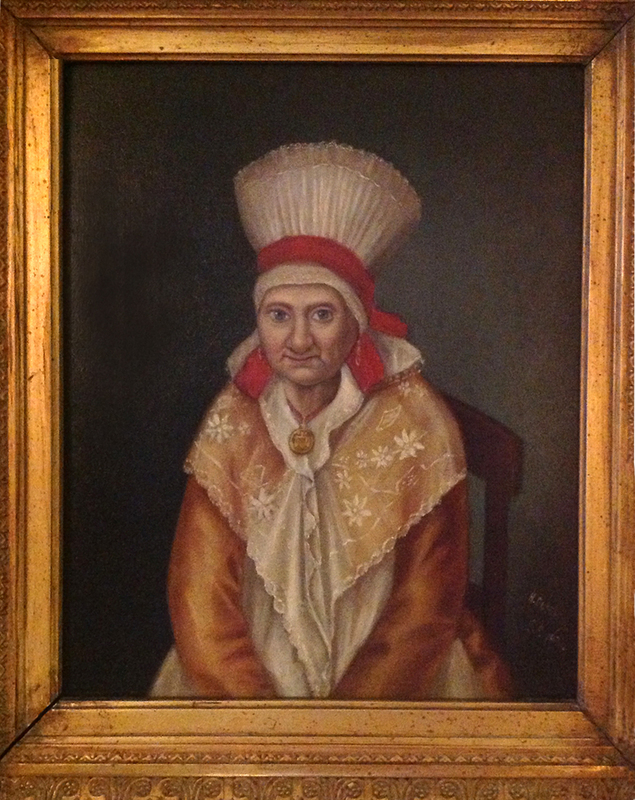 Sitting at my dining room table, I look at my great-great-great grandmother, Fannie Koschland (1759-1852). When her portrait hung above my parents’ mantelpiece, she seemed stern and mysterious in her astonishing headdress. At eye level on my wall, her blue-gray eyes invite me in. Her mouth, though serious, no longer seems forbidding. She looks like a person who would answer my questions, if she could. What was your life like in Bavaria? How did your family earn the wealth reflected in your satin gown and embroidered shawl? Did you stick to the traditional Jewish ways, or did you follow the Frankfort rabbis who were seeking to modernize the religion? Did you send your grandchildren off to America with tremulous blessings or with intuitive confidence that they would flourish in the land of freedom? The only story that has made it through the generations is that Fannie’s granddaughter, my great-grandmother, helped her dress for this portrait. I wonder if they chatted as my granddaughters and I do…. “Oma,” I can almost hear the little girl say, “This dress is so beautiful, so soft.” She buries her face in it. “Careful, don’t wrinkle it.” Fannie’s voice is loving, firm. Without answering, Fannie points to the shawl, and Bertha stands on her tip-toes to place it on her grandmother’s shoulders. Its wide collar is of such sheer fabric that the embroidered flowers take on the golden hue of the dress below. Checking herself in the looking glass, Fannie carefully sets the hat on her head. White accordion pleats reach skyward; red ribbon binds it tightly to her forehead. “Bertha, dear, would you tie the ribbon in place, please?” The child happily complies, then brings the red ends forward as a backdrop for dangling gold earrings. I wish that Fannie would speak from her heavy gilt frame to answer this question, but—alas—my imagination refuses to take that step. Does the red ribbon tie her to the folk traditions of her people? Or is she a product of the Enlightenment and the budding Reform movement in Judaism, the red ribbon simply an aesthetic choice? I seek a clue in the pendant that hangs from the ribbon. It seems to be a balance with weighing pans at each end. The emblem of a lawyer? A shopkeeper? Or merely a design, the artist’s embellishment? The signature and date on this portrait—H. Dursborg, San Francisco 1876—tell me that it is an oil copy of the original. Fifteen-year-old Bertha sailed around the horn of South America to San Francisco in 1851; 93-year-old Fannie died a year later in Bavaria. I wonder who brought the original over—Bertha or the siblings who preceded her. Does the original still exist, cherished by another branch of descendants, or did it disappear in the San Francisco earthquake that destroyed my great-uncle’s law books and another great-uncle’s medical equipment? Sadly, imagination is no substitute for the real answers that are buried with my ancestors. What questions do you wish you had asked before it was too late? Are there questions you could still ask? What are you waiting for? Clicking on the portrait to make it larger, I see that her smile is gentle and mysterious. How wonderful that the portrait has survived, and that you have it! I enjoy reading your thoughts about our relatives – perhaps all the more because my mother does not tend to reminisce about family.